Rob Megnin, Dave Beckwith, Mike Solimano, and NSAA President Michael Berry are shown with the Conversion Cup awarded to Killington Resort. 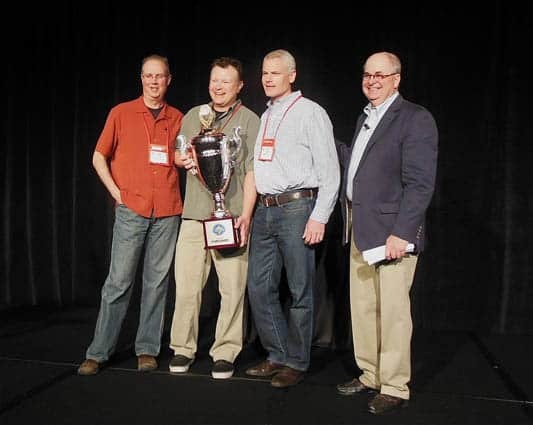 KILLINGTON–The National Ski Areas Association (NSAA) presented Killington Resort with the 2015 Conversion Cup Challenge award on May 5 at the NSAA National Convention and Tradeshow, held in San Francisco. The silver trophy is based on the Stanley Cup design and is given to a ski resort in recognition of having developed outstanding programs to convert new skiers and snowboarders into lifelong snow-sport enthusiasts. Killington was selected from a strong field of ski areas across the U.S. The other two finalists were Bromley in Vermont and Hunter Mountain in New York. The challenge was launched by NSAA in 2010 as part of its growth model to increase snow-sports participation. NSAA developed its model as a proactive way to replace the Baby Boomers who are beginning to drop out of snow sports. It was the baby-boomer generation that fueled skiing’s boom in the 1950s and 1960s, and their aging out has significant implications for the ski industry. “Without an industry-wide effort focused on attracting newer, younger participants and converting them into loyal skiers and riders, ski areas could face dramatic declines in visitation in the not-so distant future. . . . The industry can accomplish the overall turnaround that is needed by improving the conversion rate [of first-timers to repeat participants] “from 15 percent to 25 percent,” stated NSAA President Michael Berry in 2010. The Conversion Cup Challenge, which is sponsored by HEAD Wintersports, was conceived as a way to pique competition among member ski areas and recognize those who make significant strides in boosting conversion rates. The winner is chosen “based upon proven results, creative ideas, consistent execution, and long-term commitment to the conversion effort,” noted Earl Saline, NSAA director of education programming. The judges look at several key criteria, including: number and measurable success of beginner-lesson packages, sales, marketing inventiveness, and utilization of new media. Building on the success of its pioneering four-day Elan Discovery program for first-time skiers in 2013-14 (lessons rentals, lift tickets for each of any four days with a unique incentive of free new skis on the fourth day) Killington expanded the program for 2014-15 to include: 500 Elan adult ski packages, 200 Burton adult snowboard packages, and 200 Elan ski and boot packages for youth, ages four through six. Additional incentives included future discounts on lessons and lift tickets and lodging packages. Killington also partnered with Snow Operating, LLC, a company that specializes in providing Terrain-Based Learning™ (TBL), to introduce dedicated terrain-based learning areas at Snowshed (at .75 miles long the largest in the country) and at Ramshead. Killington went with the TBL concept because it was designed to give beginners “the confidence they need in a new sport and complemented our Discovery program efforts and truly enhances the first-time experience,” noted Killington Director of Snow Sports Dave Beckwith. Rob Megnin, Killington’s director of sales, reservations, and marketing, noted that the resort was asked to share its program and experience with other ski areas at previous NSAA meetings. Programs similar to Killington’s have cropped up since then and are being recognized for their efficacy (finalist Bromley offered a similar children’s program as well). Nyberg had other good news in which Killington Resort has been a key participant. SKI Magazine in partnership with the NSAA Golden Eagle Awards named Brent Giles, Powdr’s chief sustainability officer, as the “Hero of Sustainability” honoree for 2015. Giles has been instrumental in Powdr Green, the sustainability program that drives Powdr’s ski areas to reduce their environmental impact, and he spearheaded the 2014 Protect Your Playground initiative, which awarded Killington Resort $9,000 in grants for various “green” projects. Among other Powdr winners were Copper Mountain Resort in Colorado for the Best Use of Mobile Technology and Boreal’s Adam Wunderlich, director of ski patrol and risk management for Boreal and Woodward, who was named the 2015 Safety Champion in recognition of initiatives to educate guests and employees about skiing and snowboarding responsibly.